The Zen Judo Syllabus - Brown to Black. All techniques from previous sections. Okuri Ashi Barai: This throw is taken straight from the nage-no-kata and is often performed in the exact same method. Although many people see a series of sidesteps followed by a sweeping motion with the feet, there is in reality a lot more going on. As each side sidestep is taken, you should move closer into your partner. You also need to start making a wheel with you hand so that you drive your partners arm into their hip. The final sweep motion is combined with a lift so that no strength is required with the feet. O Uchi Gari: This technique is the original technique that uchi ashi gake is built upon. It should be a smooth, flowing foot sweep, however, many people forget that an initial break of balance is required with the hands during the entrance. In its second demonstration version, the aim is to move your partner around in a circle so that they fall over behind your original starting position. This requires you to keep them off balance, resting their weight on your own and maintain your own balance. Uchi Mata: The beauty of this throw, is that there are so many ways that it can be performed. It is often useful as a second technique after your partner has been off-balanced by a previous technique. It can also be an explosive throw in order to catch your partner unaware. The key part is getting the upper outside of your leg to make contact with the upper inside section of your partners leg. De Ashi Barai: This throw is sometimes described as “the banana skin technique” and this can be an accurate description of how this throw feels. Unlike ko soto gari we are not intending to twist our partners balance, instead we are making them take an exceptionally long step that causes them to loose their balance. Remember that as with all foot techniques, the hand work is still very important. Harai Goshi: Similar to uchi mata, this is a major sweeping technique. However, many people note that the name of the throw contains goshi which means ‘hip’. Therefore they try to bring their partner over the leg like ashi guruma when in reality they should come over your hip like o guruma. Some students also think it is necessary to bring their leg high into the air before sweeping it backwards. This is not the case as it causes the throw to be slow and can cause the student to loose their own balance before the throw. Ko Uchi Gari: This foot sweep has two main versions. 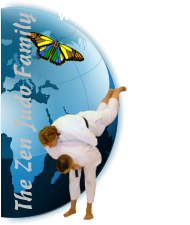 The first is to throw your partner straight back and is often used in competition judo. Here it is important to break your partners balance by using your arms first so that there is no weight on the foot that you are sweeping. The second version was developed as a zen judo version. It requires you to make your partner take a step forward, then sweeping the advancing foot in mid air and dragging it round in a circular motion so that your partner falls behind your original starting position. O Goshi: This is the final throw in our syllabus, however, interestingly it is the first technique learned in competition style judo. It is kept till the end in our style as it is used more to demonstrate complete control of balance. We learn two different versions of this throw, the first is the commonly known competition style, and the second was developed by Shihan McCarthy as a demonstration throw. In the first method, it is important to enter for the throw with knees bent and a straight back. This will allow you to lift your partner by straightening your legs instead of using strength. The lower you enter, the higher in the air your partner will be lifted. For the second version, the position required for the entry will vary depending on the height difference between yourself and your partner. The aim is to present a flat surface that your partner will fall over vertically to land at a right angle to yourself. The most important part of this throw is to protect your partners head as they come over, as this can be a very hard throw in which your partner may not be able to breakfall properly. All techniques from previous sections. Okuri Ashi Barai: This throw is taken straight from the nage-no-kata and is often performed in the exact same method. Although many people see a series of sidesteps followed by a sweeping motion with the feet, there is in reality a lot more going on. As each side sidestep is taken, you should move closer into your partner. You also need to start making a wheel with you hand so that you drive your partners arm into their hip. The final sweep motion is combined with a lift so that no strength is required with the feet. O Uchi Gari: This technique is the original technique that uchi ashi gake is built upon. It should be a smooth, flowing foot sweep, however, many people forget that an initial break of balance is required with the hands during the entrance. In its second demonstration version, the aim is to move your partner around in a circle so that they fall over behind your original starting position. This requires you to keep them off balance, resting their weight on your own and maintain your own balance. Uchi Mata: The beauty of this throw, is that there are so many ways that it can be performed. It is often useful as a second technique after your partner has been off- balanced by a previous technique. It can also be an explosive throw in order to catch your partner unaware. The key part is getting the upper outside of your leg to make contact with the upper inside section of your partners leg. De Ashi Barai: This throw is sometimes described as “the banana skin technique” and this can be an accurate description of how this throw feels. Unlike ko soto gari we are not intending to twist our partners balance, instead we are making them take an exceptionally long step that causes them to loose their balance. Remember that as with all foot techniques, the hand work is still very important. Harai Goshi: Similar to uchi mata, this is a major sweeping technique. However, many people note that the name of the throw contains goshi which means ‘hip’. Therefore they try to bring their partner over the leg like ashi guruma when in reality they should come over your hip like o guruma. Some students also think it is necessary to bring their leg high into the air before sweeping it backwards. This is not the case as it causes the throw to be slow and can cause the student to loose their own balance before the throw. Ko Uchi Gari: This foot sweep has two main versions. The first is to throw your partner straight back and is often used in competition judo. Here it is important to break your partners balance by using your arms first so that there is no weight on the foot that you are sweeping. The second version was developed as a zen judo version. It requires you to make your partner take a step forward, then sweeping the advancing foot in mid air and dragging it round in a circular motion so that your partner falls behind your original starting position. O Goshi: This is the final throw in our syllabus, however, interestingly it is the first technique learned in competition style judo. It is kept till the end in our style as it is used more to demonstrate complete control of balance. We learn two different versions of this throw, the first is the commonly known competition style, and the second was developed by Shihan McCarthy as a demonstration throw. In the first method, it is important to enter for the throw with knees bent and a straight back. This will allow you to lift your partner by straightening your legs instead of using strength. The lower you enter, the higher in the air your partner will be lifted. For the second version, the position required for the entry will vary depending on the height difference between yourself and your partner. The aim is to present a flat surface that your partner will fall over vertically to land at a right angle to yourself. The most important part of this throw is to protect your partners head as they come over, as this can be a very hard throw in which your partner may not be able to breakfall properly.